This is the only direct water and golf course view in the Huntington Subdivision with it's own community pool.The patio view you see is water, grass, trees and wildlife.The kitchen features granite counter tops,an island counter with breakfast area, lots of pullouts, newer stainless appliances and tiled backsplash.The living room is open to the family room and the tiles are 18'' and on the diagonal throughout the living areas. The master suite is oversized with two walk in closets, glass enclosed shower, granite counter top with his and her sinks and Roman tub.The 2nd bedroom has a walk in closet with en-suite bathroom and granite counter top.The 3rd room can be easily converted to a bedroom. 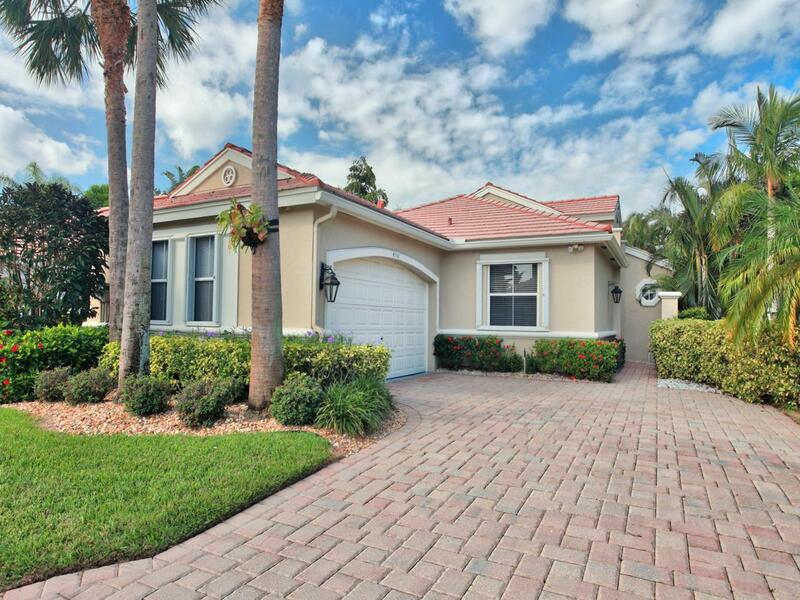 New roof 11/2018, newer AC system, hot water heater & accordion / panel shutters, A must see home.WYCLIFFE GOLF & COUNTRY CLUB The Wycliffe Golf & Country Club is a full service year round facility and offers a life style that gives you the feeling that you are on vacation all the time. The Country club features 2 championship golf courses, practice areas and a professionally run pro shop. There are 14 Har-Tru tennis courts, viewing pavilion and pro shop with pickle ball courts opened in 2017. The club has just installed two new Bocci courts and has a resort style swimming facility and hot tub with cabanas and plenty of lounge chairs. Wycliffe also features two award winning dining facilities. The Grande Dining Room and Lounge are used for all special occasions whether it is for a theme night, dinner dances, weddings, entertainment and many other club functions. The Grille Room is more casual and is open daily for continental breakfast, lunch and dinners. Fitness is very special at Wycliffe with a 2500 sq ft facility overlooking the pool area and containing state of the art fitness equipment, full time trainers, palaties, aerobics, sauna, steam, locker rooms and a European Spa to pamper you. Wycliffe is a very social facility with Ladies & Mens card rooms, clubs to join, charities, meeting rooms and enough to keep you as busy as you want to be. This is a must see facility. We love to give tours. The Grille Room has gone through a major reconfiguration with new furniture, fixtures, flooring walls and ceiling. Both golf courses have had new fairways and greens replaced within the last few years (2015-2016) And the ladies card room has been totally refurbished with new tables, chairs, carpeting, window treatments and snack area. (2016-2017) Plans are being made to update and modernize the rest of the facility starting the summer of 2018. Enlarging the fitness center and European spa, adding a new third dining facility and new lobby lounge, a new practice golf area and more. Listing provided courtesy of Berkshire Hathaway Florida Realty.